Harbor has been working hard to bring security tokens into the world. This is how we see the ecosystem shaping up, and how Harbor interacts with each piece. We at Harbor believe that the next big wave in capital markets will be the tokenization of private securities. Unlike cryptocurrencies, security tokens are ownership in real-world assets, such as commercial real estate, private companies, investment funds, debt, fine art, etc. Addressing the needs of these stakeholders requires a brand new technology stack and ecosystem that we call the Security Token Stack — a network of on-chain smart contracts and off-chain processes that work together to create a holistic solution for issuing, trading, and auditing securities using the blockchain as a store of value. In terms of the buyer and seller, examples include KYC, AML and investor accreditation checks, special rules for affiliates and control persons, or specific jurisdictional requirements based on the location of both buyer and seller. For the trade itself, the compliance layer must also maintain the exemptions governing private securities to avoid having to issue a public offering or to maintain tax status — examples include minimum and maximum investor numbers, investor concentration limits, foreign ownership limits, and more. And trades should be controlled to proper venues, like peer-to-peer and properly licensed exchanges. The blockchain is the foundation offering trustless transactions, fast settlement times, security and the network on which all higher levels in the stack are built. The blockchain offers issuers and regulators visibility and provides investors with connectivity and discoverability leading to liquidity. Other layers piggyback off the primitives that the blockchain provides. Different chains have different characteristics and choosing a chain on which to issue security tokens involves weighing the tradeoffs. Harbor is ultimately chain agnostic, but we’re starting with the Ethereum chain because it’s programmer friendly, has market penetration and has the largest ecosystem of wallets, exchanges and related services. Ethereum also has a vibrant developer community of innumerable engineers continuously working to improve privacy, speed and scalability. The security token is the on-chain technology layer that, in combination with the compliance platform, enforces compliant transactions required by issuers and regulators. 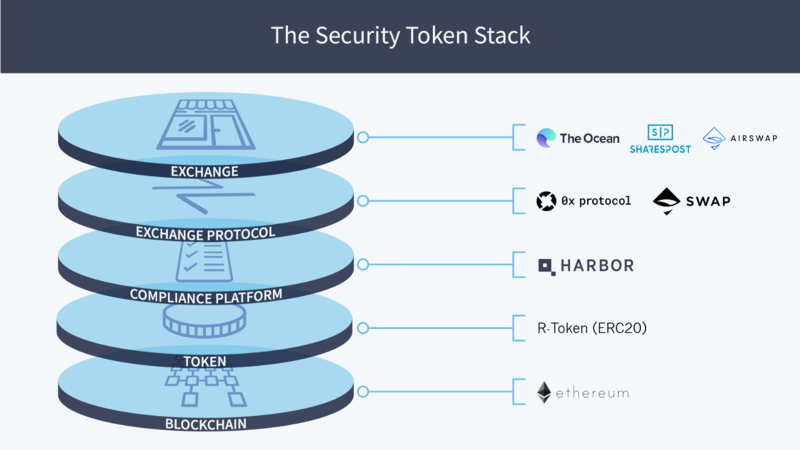 Harbor built the R-Token (an ERC-20 compatible token), as a core primitive of its compliance platform, to ensure compliance from initial offering through secondary trades. The security token does upfront checks using the whitelist provided by the compliance platform to ensure that all transactions occur within the required guidelines. The compliance platform consists of off-chain processes that conduct issuer due diligence,ensure that investors are qualified to participate in offerings and later trades, and update rules and permissions dynamically over time to ensure compliant secondary trading. At Harbor, we work with vendors, other broker-dealers, consultants, and our own compliance team to verify investors and to make sure that every initial investment and secondary trade adheres to the appropriate regulations and issuer rules. The compliance platform continuously correlates real world identity to blockchain wallet address, dynamically updating permissions to ensure the full set of rules governing the who, what, and where of compliance are enforced. It’s also important to keep in mind that the issuer needs to know in real time the real world identity of their investors in order to, among other things, issue dividends or distributions and provide the required withholding and tax reporting. The compliance platform bridges the on-chain and off-chain worlds throughout the lifecycle of the offering by publishing the result of off-chain processes to the on-chain whitelist. Elements of the compliance platform include: the trade controller, issuance platform, policies and procedures, secondary trading, and testing/auditing. Exchange protocols like 0x and Swap are an essential layer to ensure a global liquidity pool. Exchange protocols connect order books from different marketplaces and enable the exchange of tokenized securities by providing developers an open protocol to build on. The decentralized protocols lower the cost of trading, remove barriers for overseas investors, and enhance security as it is not a centralized third party that holds funds or securities. Decentralized protocols allow for custody-less trades with near instantaneous settlement and no counterparty risk, something that only blockchain technology can deliver. In the case of 0x, they do this by lowering the barrier to entry for relayers to build on top of the protocol and allow trading for all generalized token standards. Innovation from these protocols results in vibrant and growing communities of marketplaces that Harbor’s Security Tokens can trade on. Exchanges (exchanges, 0x relayers, second-layer protocols) provide a venue for liquidity, where buyers and sellers find trade execution once secondary trades are allowed to occur. In the Security Token Stack, it is essential that marketplaces have met the regulatory guidelines required for operating as an exchange. As part of confirming the “where” of compliance, R-Token can ensure securities trade only on properly licensed exchanges, like The Ocean, Sharespost, etc. We’re excited by an increasing number of exchanges taking the necessary steps to receive licensing, and look forward to partnering with licensed exchanges around the world. Critical to the secure, compliant transfer of funds are digital wallets and custodian services (particularly for institutional investors) from providers such as BitGo. Also important are services to assist with portfolio management and tax accounting like Lumina. There are a number of second-layer protocols enhancing the security token ecosystem, including dYdX for margin trading and derivatives, Set Protocol for creating baskets of tokens (functionally bespoke ETFs), Dharma for tokenized debt, and more. In a future post, we will dive deeper into the use cases enabled by tokenized securities and second-layer protocols. The Security Token Stack and blockchain technology have the potential to reengineer financial markets, bringing massive efficiencies to private securities and making it possible to connect buyers and sellers around the world to trade tokenized securities 24/7/365 with near-instantaneous settlement and no counterparty risk — something only possible with blockchain. We believe the Security Token Stack will bridge to, not displace, the traditional finance ecosystem. For tokenization to reach its potential, it needs both a thriving ecosystem of technology providers and an ecosystem of market-makers, investment banks, institutional investors, broker-dealers, etc. We’re excited to help drive this future forward. If you are as excited as we are, come join us!